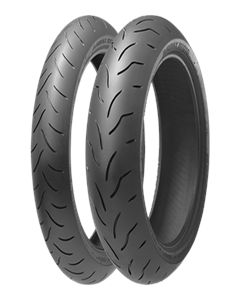 The new hypersport tire BT-016 is designed to maximize the sporty performance of sport bikes on the road today and enables every rider to enjoy our Genuine MotoGP Technology. The advanced multi-compound technology (3LC & 5LC) applied to both front and rear tires offers the rider the performance he demands in every riding mode. 3LC (3 Layer Compound) provides grip performance demanded in every aspect and all riding modes. The center compound offers linear handling. The shoulder compound secures high grip and solid contact feeling. Parallel S shaped grooves give optimal cornering force to improve stability, linear handling and absorption. Groove location across tread center secures rich contact feeling and stable wet performance. 5LC (5 Layer Compound) offers ideal grip performance demanded in every riding mode and aspect. The center compound offers good stability. The shoulder compound transfers the engine power to the road with strong traction. The edge compound offers strong side grip and solid contact feeling in deep lean angles. L shaped grooves enhance shock absorption and rear-end steering. Groove location not across tread center area provides both wet performance and strong traction. High speed durability is also maximized.